A substitute teacher who most recently worked for Akron schools has been charged by both Hudson and Stow police for allegedly having unlawful sexual conduct with a 14-year-old Hudson girl police say he met online. 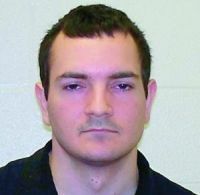 Hudson police arrested Albert J. Calabrese III, 24, of Kent, May 21 and charged him with sexual imposition, a misdemeanor. Calabrese was then transferred to the Stow Police Department, where he was charged with unlawful sexual conduct with a minor, a felony. Your blog reminds me of the child-abuse wanted criminals that Oprah is publicizing so that they got caught. Calabrese, 24, of Marion, pleaded guilty to engaging in sexual contact with five female victims, two of whom were under the age of 13 and three under the age of 11 at locations including in Penfield and at Generations daycare locations in Irondequoit, Fairport and Rochester.